SettingI began my week with a memorable pair of images that I think may foreshadow the future of the Anglican Communion. On my way to worship early Sunday morning, I suddenly made a turn and was confronted with the tower of Canterbury Cathedral shining in the early summer sunshine. We worshiped in the choir area where the stones are chipped and gnarled by generations of reverent feet. The service was the traditional Anglican rite. I could not help thinking of Thomas Cranmer, the first Protestant archbishop, who had so shaped the Anglican way by his precious words, his cautious but principled government of the Church through many tribulations, by his final self-offering on the pyre. Sunday evening I found myself seated around a table with bishops and archbishops from all parts of the world. As the meeting closed, the Most Reverend Joseph Adetiloye was asked to pray. Though soft-spoken, he radiates spiritual gravitas. He presides over the world’s largest province of Anglicans, where there are far more Anglicans in church on Sunday than in the United States and England combined. As the Archbishop prayed in precise but African English, I heard the same cadences of beauty and piety proceed from his mouth that I had heard that morning in the liturgy. George Herbert the poet once predicted that the power of the British Church would follow the horizon west. Truly in our day the vital glory of Anglicanism has taken residence south of the equator. What Ever Happened to the Decade of Evangelism?So how large is the Anglican Communion? The official figures for 1997 claim 63 million. A Sunday Times survey, however, claimed that only 23 million actually attend church on a given Sunday. The most embarrassing statistic is that while England claims 26 million baptized members, only a million attend church. Archbishop Robin Eames of Ireland explained that this gap "simply reflects the reality that not every baptised member is in church on Sunday every week." Huh? Denials like this are part of the problem. It is hard to see that the Decade of Evangelism has had any impact in the West. But then the Decade of Evangelism was the Third World’s baby to begin with. (To be sure, the idea of calling the 90’s a Decade of Evangelism came from Bishop Alden Hathaway and was presented to the Episcopal Church in 1988.) But one gets the sense that many Western bishops humored their Third World comrades by voting for it. After all, who can oppose evangelism, especially if one is free to identify it with one’s own pet projects? I have just seen the Report of the mission section "Called to Live and Proclaim the Good News." It is not bad overall, it has some helpful analysis of the missionary setting of the churches. Still, there is something missing, the urgency, the boldness, the sacrificial spirit that is called for by the Risen Lord. The problem is not in the plans but in the will to evangelise. The Business of LambethAlthough the Lambeth Conference is not a political legislature, it is the closest analogy to the early Church’s ecumenical councils that we have. To moblilize 800 people (and bishops to boot) to reach a conclusion on any one issue or range of issues is a colossal task. The key advantage in influencing so large an assembly clearly belongs to those who set the agenda. If one steps back and surveys the array of agenda-setting devices, it is perfectly clear that the "progressivist" leadership of the Anglican Consultative Council, which is heavily indebted to American Episcopal Church, has had a massive advantage. The Oxford Centre/AAC team has tried to offer a counterbalance to this initial advantage. Section One: Called to Full Humanity, dealing with social ethical issues of environment, euthanasia, technology, sexuality, international debt. Section Two: Holding and Sharing the Faith, dealing with mission and evangelism, interfaith relations, and youth. Section Three: Living as Anglicans in a Plural World, dealing with structures of authority within the Communion. Section Four: Seeking Full Visible Unity, dealing with ecumenism. Many of these sections are divided into subsections by topic. Bishops were invited to sign up for the topic of their choice. Thus, for instance, it is not accidental that Jim Stanton and Jack Spong are both in the Human Sexuality sub-section. By the end of the second week, each section will have written a report on behalf of the whole Conference, along with accompanying Resolutions. The Reports are approved by the Conference and then bound together in a volume. Clearly there has been much vigorous fellowship in some of the subsections. The Human Sexuality group has met overtime but seemed to have reached a conservative "consensus" by the week’s end. In other groups, there was clearly not enough debate. The euthanasia group appears to be prepared to defend, after very little debate, withdrawal of food and water from people in a persistent vegetative state. The International Debt section appears to be dominated by one agenda: a call for total remission. Conference Resolutions, which will be debated next week, carry more weight than the section reports for a number of reasons. First, they are shorter and attempt to sum up the wisdom on a particular subject. Secondly, they represent the mind of the whole Conference rather than merely that of one section. Much of the Conference agenda for the third week will involve debate on the Resolutions. Some Resolutions will sail through without debate as "Agreed Resolutions," unless fifty bishops sign a petition opposing them. As many of us know from Episcopal Church politics, one must read the fine print of such Resolutions as they go by. There was an Agreed Resolution on "Unity Within the Provinces of the Anglican Communion" that would place sole oversight of "alternative oversight" of parishes (like the one in Arkansas) with the Archbishop of Canterbury. Because this issue touches on the larger problems of theological disunity in the Communion, conservatives mustered fifty votes to oppose it. Resolutions come not only from the four Sections but also from the 9 regional groups of the 37 Provinces, e.g., North America. It seems clear that some Resolutions from the sections will overlap with, and probably conflict with, the Resolutions of the sections. The task of the Resolutions Committee is to bring a coherent package to the full Conference next week. Whether the Committee, which is composed predominantly of liberals, will perform that task fairly is yet to be seen. Looking ahead to the week of August 2-9, the key legislative sections of the whole Conference begin Tuesday afternoon and conclude by Friday noon. The closing session is held Saturday morning and bishops begin to leave on Sunday. Somewhat surprisingly, there is no final service at the Cathedral. Events of the WeekThe Spong Show is, of course, a running attraction. There was an ongoing debate about what Jack Spong said about the African Christians and what he meant. By mid-week Spong had made an apology of sorts for describing African Christians as having just "moved out of animism into a very superstitious kind of Christianity." This Clintonesque apology did not carry much conviction, as he went on explain: "I don’t know what to do about [their offence]. Religion is a deeply emotional thing. It gets into the very fibre of our soul. It is part of our security system." In other words, their reaction is a psychological defense mechanism to protect themselves from the painful recognition that he’s right. Personally, I do not think Jack Spong is a racist. I do think he manifests that "politically correct" cultural arrogance characteristic of the Western knowledge class. What Bishop Spong cannot fathom is that the insult which the Africans most resent is the insult to Jesus Christ. It’s a theological offence, and they take it seriously. We in the Episcopal Church have become inured to this man’s constant blasphemy. Our African brothers and sisters have paid a high price for their faith, and they are not amused. The week began with a discussion of Christian-Muslim relations. The morning press briefing included two rather different figures: Michael Nazir-Ali, the Bishop of Rochester, and Josiah Idowu-Fearon, bishop of Kudena in Nigeria. Nazir-Ali, who is Pakistani by birth but Etonian by education, is cool, sophisticated, and convinced that Christians and Muslims can live in harmony together, respecting each others’ rights. Idowu-Fearon, whose evangelism has been primarily among animists, is also interested in Christians learning about Islam, but he called Nazir Ali’s vision "an ideal, not the reality." The reality, he says, is that in Nigeria conversion to Christianity from Islam spells death. He described the way in which Nigerian Christians often experience deprivation and persecution in the Muslim north. Tuesday was tea-time, as 2,000 bishops and spouses paid a visit to the nominal head of the Church of England at Buckingham Palace. Queen Elizabeth was generous in personally greeting many. The handlers made sure that she met the 11 women bishops, even though she is reported to be opposed to women’s ordination. (From the official press treatment, one would gather that women’s ordination, especially to the episcopate, is not an issue at all.) The Queen’s arrival was announced by a chorus of "God Save the Queen!" At 6pm, the anthem was played again, with the apparent message "Y’all go on home now!" On Wednesday international debt was back in the headlines. World Bank President James Wolfensohn and his negative words were out of mind, and Archbishop Ndungane of Capetown, who apparently wants to make world debt the equivalent of apartheid, called for immediate action on the program of canceling all debt by 2000. The day before Prime Minister Tony Blair, one of the G8 ministers pilloried by the Jubilee movement, promised an increase of $2.5 billion over the next three years toward international development. That’s about one year too late and $222.5 billion too little to achieve the Jubilee. If Ndungane’s international mediation court is set up, perhaps it can present the U.S. Congress with a bill for the balance. Isolationist conservatives and liberals would love such a move to argue for defunding the World Bank and IMF altogether! The head of the section on international debt is Bishop Peter Selby of Worcester, who seems to regard the past decade not as a springtime of economic democracy but as the dark age of economic oppression (there has been no mention here of the fall of Communism since 1988). His section refused to consider the Five Talents project because, he said, the proposal did not sufficiently deal with certain justice concerns of the poor. Why doesn’t he let the poor decide about this? Interestingly, although Archbishop Carey himself made the first contribution to Five Talents of £1,000, the Lambeth Daily has not yet mentioned the existence of the proposal. Each day the bishops meet for Bible study, with accompanying video presentations. Certainly this is good in principle. Apparently the videos are often quite powerful (e.g., one on reconciliation in Northern Ireland), but they are only tangentially connected to the text of 2 Corinthians. It is interesting to note that one bshop, Paul Barnett of Australia, has written a full-length commentary on 2 Corinthians and was not consulted about the Bible study. "Imaginative reading," rather than close exegesis, is a la mode. The AAC’s Role at LambethThe Oxford Centre for Mission Study/AAC headquarters at the Franciscan Centre has become a hub of activity this week. There have been major receptions and meetings almost every night as well as daily meetings. We have offered bishops access to e-mail, FAX and phone facilities, and word seems to have gotten out that the Centre is a place for tired bishops to come get a break from the heavy schedule of the Conference. In addition, several of our staff are specifically working with bishops in the four sections, helping them write up proposals and hosting meetings of bishops who need a place to come together. Wednesday night was a backbreaker for the staff but a blessing for the bishops. Early in the evening, we first hosted a Paskistani-Indian dinner with genuine Tandoori food. It was wonderful to see bishops from these rival nations sitting together. Of course, they have much in common since in their countries Christianity is under attack both from militant Muslims and Hindus. Immediately following this dinner, there was a gathering of 200 bishops and wives to hear a presentation from Christl Vonholdt, one of our team. Christl lives in the Reichelsheim Fellowship near Frankfurt, Germany. The Fellowship is a kind of L’Abri, and it has always included a number of homosexuals. We had earlier circulated six brochures by Christl which put the gay rights movement in the contemporary cultural context. After Christl spoke, four former homosexuals gave their testimonies of transformation in Christ. They put a human face on the issue that has been hanging over this Conference. We had invited all 800 bishops to the meeting. Most of those who came were traditionalists, but some like Otis Charles, the self-confessed gay bishop, attended respectfully. He later said that Integrity figured there were only 10 ex-gays in the Episcopal Church and that many who did move out of the gay community left the Church for more evangelical denominations. Precisely! The Five Talents project, as mentioned above, has been ignored in favor of grandiose lecturing of world leaders on macro-economics. In order to get approval, it had to be supported by a resolution from one of the regions. The Central and East African region failed at first to endorse it, but at a critical moment, God intervened. Bishop Simon Chiwanga found himself, uncharacteristically, with some free time. As he strolled outside te place where the region was meeting, he met two people who told him Five Talents was dead. Bishop Chiwanga proceeded into the meeting, pleaded for the project, and it was added as an agreed motion. It appears likely to go through unless 50 bishops choose to oppose it by petition. Friday was Celebrate Nigeria night. Nearly 200 Nigerian bishops and wives came decked out in their traditional attire. There was worship, singing, and words of encouragement. One sensed corporately their confidence that their moment of leadership in the Comunion has come. May it be so, Lord! On Saturday, the Franciscan Centre was quiet, but it is a calm before the storm. We are tracking the section reports and the proposed resolutions as they come in. We hope to be ready to help bishops respond to whatever comes out of the Resolutions Committee. But at this moment we feel like we are hitting tennis balls against a backstop. You are not sure how well prepared you are until you have a live player on the opposite court. The final set begins on Tuesday. It’s Saturday night. I am planning to attend the Cathedral tomorrow again. Thomas Cranmer, pray for us! Meet the AAC TeamSeveral members of the team left to go home, but others arrived to fill their ranks. The dormitory is so full that one person is sleeping in the kitchen! Christl Vonholdt has been an immense help to the team. She had come to the Dallas Conference last September to share her expertise in understanding and counseling homosexuals. She has edited a collection of texts on homosexuality entitled Striving for Gender Identity. She speaks quietly but with complete confidence that homosexuality is a disorder that can usually be healed by God’s grace and by skilled counseling. Rolf-Alexander Thieke is a Lutheran pastor and teacher from Baden, near Lake Constance in Bavaria. Rolf took his vacation time to drive over to Canterbury carrying the newly published pamphlets by Christl’s pamphlets on homosexuality. Rolf has his own ministry of writing and of counseling homosexuals. He stayed with us a week helping in whatever way he could. Timothy Kujero is a priest and press officer from Nigeria. This has been Timothy’s first trip outside Nigeria and he has had some interesting reactios to Western food. Presented with a chicken sandwich, Timothy said, "In my country when you order chicken, they give you a chicken!" Timothy has been helping with all our projects and was the Centre host for Nigeria night on Friday. Yvonne Boltz is the captain of the prayer warriors. Yvonne, who is married to Roger Boltz, Chief Mission Officer of the AAC, organized a prayer team that goes off every morning and prays till 10 pm for the Conference and for the ministry team. We have had our ups and downs, our crises and near disasters. But God has gone before in every case, working good where we fell short. We are convinced that the covering of prayer is a major part of our fruitfulness and protection to date. Les Martin is a priest from the diocese of East Tennessee. Les spent a month in England, attending the pre-Lambeth events. Once the conference began, Les collected all the stories for the day so that team members could be current on what issues were getting play in the press. We thank God for him as he heads home. 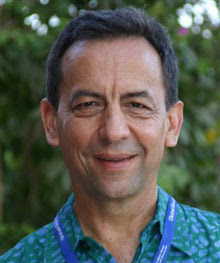 Bishop Alex Dickson, the AAC Vice President. is retired and thus is not an invited member of the Conference. However, he is a presence. Alex took the initiative to lead the American bishops in an act of repentance before the Africans at the pre-Lambeth conference of the Evangelical Fellowship in the Anglican Communion (EFAC). Many believe that moment forged a bond of sympathy that has continued throughout the Conference. Alex has stayed on as an advocate for Bishop John Rucyahana of Rwanda, who is under fire for taking the Rev. T. J. Johnson and his parish in Little Rock under his wing. Looking Ahead to Lambeth, Week ThreeIn our daily worship this week, we came across a remarkable concurrence of lessons. First, there was the proto-feminist Jael pounding the tent peg through Sisera’s temple (Judg 4:21). Next we had the apostles filling Judas’ hole in the apostolic band by electing Matthias (Acts 1:15-26). Finally, there was that pious man Joseph and the women seeing to it that Jesus’ body was properly buried (Matthew 27:57-61). It seemed to me the Word was telling us to do whatever it takes to complete the job God has set before us. At the 1988 Conference, the balance shifted at this stage. During the early sessions the voices of the African and other Third World bishops had been prominent, correctly reflecting the numerical balance of Anglicanism, which was noticeable even in 1988. When it came to the final third of the Conference, however, and the drawing up of resolutions, the Anglo-American axis took over, producing a series of statements which, on the whole, allowed Provinces to do whatever they wanted. Pray that that scenario not happen again. Pray that the orthodox leaders will be wise, bold and cooperative. Pray that the Lord will foil the devices of the Enemy. Pray that unity and truth may prevail and that our Anglican Communion as a whole may be put back on the road to health. Lambeth Report: Was It a Defining Moment?